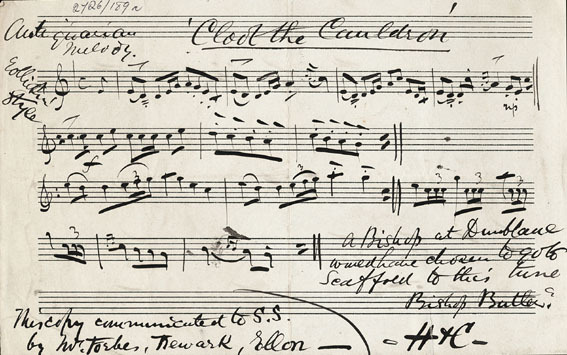 Item Description Manuscript in Skinner's hand of the 'Antiquarian Melody Cloot the Cauldron, in 'rollickin' style'. Skinner has written this down very quickly. He notes that: This copy communicated to S. S. by Mr Forbes, Newark, Ellon-', so he possibly wrote it down from Forbes's playing. Skinner also noted: A Bishop at Dunblane would have chosen to go to Scaffold to this tune (-) Bishop Butler? H & C [Harp & Claymore].